Featuring Super Saiyan Goku, Majin Vegeta, Frieza, Beerus/Bills and an Oozaru, these straps will look great attached to your keyring! From Bandai comes the 8th Dragonball Z Ultimate Deformed Capsule set! 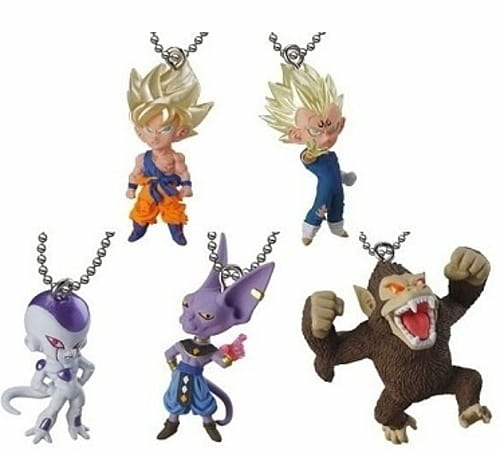 Featuring Super Saiyan Goku, Majin Vegeta, Frieza, Beerus/Bills and an Oozaru, these straps will look great attached to your keyring, phone or any other places you can find to attach them to! Please note, due to the product packaging these are blind boxed and we cannot guarantee which of these items you will receive.